Hi Liz! I've been following your blog for quite some time now. I really like reading your posts because they are so helpful to me in so many ways. I really like and appreciate that you care about affordable beauty! So, I have really oily skin. As if that isn't enough, I also sweat rather excessively. Which is really frustrating because I am still a student (who walks around the campus a lot, under the scorching heat of the sun). My skin breaks out a lot too. By a lot, I mean I always have a big nasty zit or two on my face. They never go away! I don't really know where I've gone wrong. I try to clean my face as regularly (not excessively) as possible, but it seems like I would never be able to have clear skin. I know that you also have oily skin too, so I thought it would be a good idea to ask you about these things. 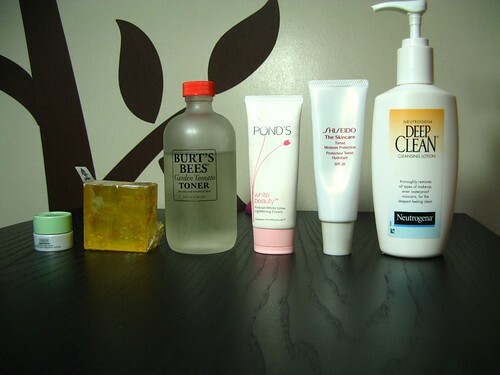 I'd really appreciate if you recommend me any product (for oily skin) that you swear by. Thanks a lot! Also, I just like to tell you how I enjoy reading your blog, and that your posts are so helpful. More power, Liz! Hi Honey! Thanks so much for following my site. It really makes me day when I hear from lurkers! So, about your problem. I'd like to recommend my Holy Grail product - Burt's Bees Garden Tomato Toner. It's labeled as good for troubled and oily skin, and yes, it does help clear my face of pimples and it helps lessen the oiliness. I would also recommend the Skin Hour Mattifying Day Gel. Lauren and Kira are such fans! They've both given the product rave reviews, and they are perhaps the oiliest people I know (no offense to you guys lol). I haven't tried the product personally, but it looks extremely promising. It's even better that it also functions as a makeup primer and sunblock all in one. Now, to deal with oil as it comes, don't forget to bring a blotting powder such as MAC Blot Pressed Powder and blotting paper which you can easily find in most drugstores. A good substitute for packed blotting paper is a paper hand towel - they absorb oil and sweat really well! Hi Liz! I've been a silent reader of your blog for quite a long time. I try to read your blog if I have some time to spare. My favorite topics would be your make up reviews and tutorial. I'm sending you this to ask you, how you store your make up? As you know, summer here in the Philippines is incredibly hot! My room is like a sauna! I recently purchased some make up and I'm so afraid that it would easily melt or spoil, especially the Bobbi Brown Concealer Kit. I think it is already melting because oil/moist is already visible on top. I seldom buy make up because I don't have much to spend. So I would really die if my make up, specifically my latest purchases, would not last for a month or two because of the heat. Ok, that's exaggerated. But I'm sure you know what I mean. 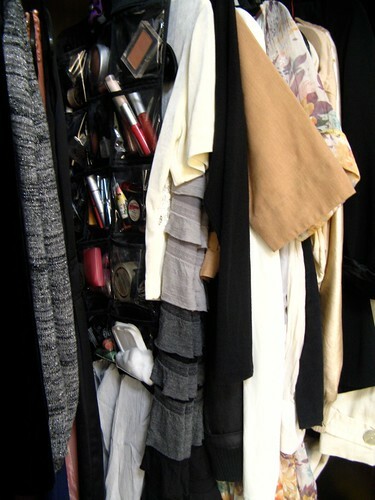 So, I would very much appreciate if you could share to me and your readers how you store your collection of make up. Maybe you could show your container boxes or whatever you call them / pouch / cabinet! 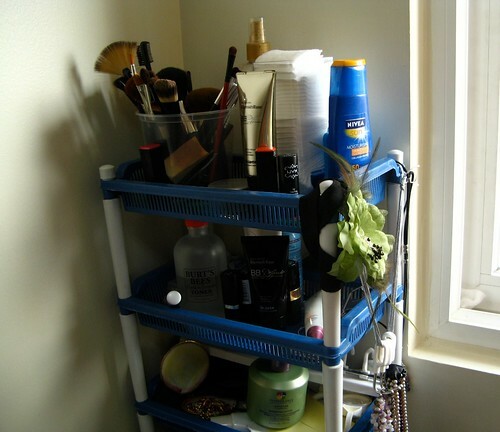 As long as you store your makeup in a cool, dry spot away from direct sunlight, you're okay. Make sure that your room is properly ventilated by opening your door or your window (even just a crack!). Turning your fan on should help circulate the hot air out. If this doesn't help, your last resort should be...the fridge! Store all cream and liquid makeup in the fridge when you're not using them. Powders are okay to be left out since they're not moist and so do not spoil as easily. As you requested, here are pictures of how I store my makeup! I bought the organizer from SM for only P300. To keep my makeup safe and cool, I just hang it in my closet. Stuff that I use often go to the plastic shelves, beside my window (not too worried about the heat because my room is airconditioned). Hopes this helps, Honey and Karen!